Scotland is such a beautiful location for a holiday cottage, and the selection is varied but on this site they are all superb! Scottish holiday cottages give you the chance to find out about the real Scottish people - enigmatic, hospitable, proud and very friendly. We have Scottish holiday cottages in the Highlands - ideal for exploring the northern reaches of Scotland where you can walk all day without seeing another soul. Or stay in self-catering accommodation near Glasgow - and visit this great city with many cultural attractions as well as fantastic shopping and stunning architecture. 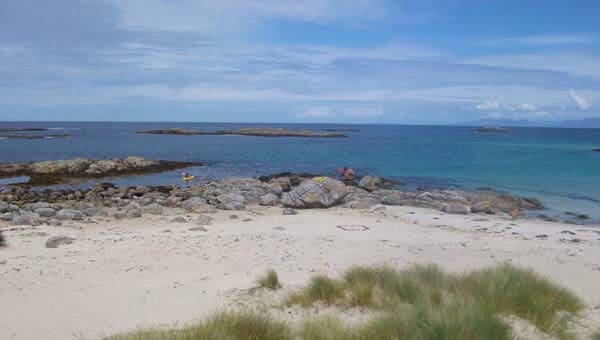 The west coast of Scotland is a first choice for many a family holiday - fabulous beaches and delicious fresh seafood to enjoy in restaurants or take back to cook in your self catering cottage near Oban. Oban is a great place to catch an iconic CalMac ferry to the isles - it is even possible to visit some for a day trip. Other islands are further away and the best way to explore them is to rent a Scottish island holiday home. All the Scottish islands are different in subtle ways but they also have a similarity - hear Gaelic being spoken in the village shop, cycle on roads with little traffic, spot a sea eagle, kayak or swim in pristine waters, picnic on empty sandy beaches, walk along the machair or climb a hill, fish for brown trout in a stream or lochan ..... the joys are endless and sublime holiday memories will be made on a Scottish island holiday! We have remote cottages to let by the sea, large holiday houses in gorgeous Scottish glens, idyllic cottages in isolated locations, and luxury vacation cottages in the Borders. Much of Scotland is quiet and not frequently visited - parts of the Highlands and Dumfries and Galloway are remote and admidst the stunning landscape are isolated cottages that are available for vacation lets - some have swimmingpools and hot tubs. Scotland has a long coast so there are many seaside cottages to rent - if you are holidaying on the Speyside coast then you are likely to spot the Moray dolphins - an unforgettable sight. There are many coastal cottages in Fife and the Fife beaches are superb with many blue flags beaches including Elie and St Andrews. Vast empty sandy beaches with large sand dunes behind them (children adore playing in the dunes and sliding down them!) are ideal for a holiday by the sea - why not take a portable barbeque or a more traditional picnic and enjoy making family memories on your seaside holiday. The sea isn't that warm but it's exilarating and whilst adults might prefer to wear a wetsuit, children rarely notice the temperature of the water and are happy to swim and surf in the North Sea! The Aberdeenshire coast has many cottages by the sea - you will go to sleep with the sound of the waves lapping on the harbour wall below. Perthshire is one of the most popular counties in Scotland to rent holiday accommodation, self-catering properties vary from a stone village house in Crieff or a remote whitewashed cottage in rural Glen Lyon to a large country house in Pitlochry. They are all very high quality on Which Cottage and you will be spoilt for choice here, last minute bookings are highlighted using the date search - this is very useful especially at premium times such as school holidays (including half terms) and bank/national holidays. Perthshire offers a lot of choice for outdoor activities in Scotland - you can enjoy walking, cycling, climbing, abseiling, geocaching, white water rafting, canyoning and any manner or other activities. The county extends out of Perth and Kinross, Stathearn and Tayside and is also a popular place for country sports - shooting, stalking and fishing are available in season throughout Scotland and holiday cottage owners can suggest and offer guidence of where to go, a personal recommendation from a property owner can be invaluable. Many of the cottages where these activities are offered are on sporting estates which have diversified into tourism, and they welcome visitors to stay from all over the world.